Founded in 1987, Kipling North America is a division of VF Sportswear, Inc., with headquarters in New York City. Its distinctive bags are developed and designed in Antwerp, Belgium, and distributed in 55 countries worldwide. The brand's name was inspired by "The Jungle Book" author, Rudyard Kipling. Next stops for the #MyKiplingBag Tour will be Honolulu and Miami. 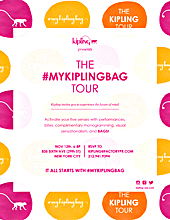 For more information and to shop the brand, please visit: www.kipling-usa.com. COPYRIGHT © 2013, STYLE 1 MEDIA | For information about this website please contact us.